Welcome to Spectrum! Thank you very much for visiting with us, and we are glad to have an opportunity to share Spectrum’s background and explain why otherwise rational people would want to start an airplane company. Aviation has brought us many things in our lives. It has been an inspiring, beautiful and practical journey when private airplanes have been involved. Unfortunately, operating private aircraft has also proven to be an expensive proposition, and when piston engines are involved the experience can be limited in range, performance and reliability. Aviation has also brought long hours in commercial terminals, seemingly endless hours sitting in coach and many opportunities to take off our shoes for inspection. In spite of all this, the airlines meet a transportation need at a (usually) reasonable cost and (sometimes) tolerable inconvenience. 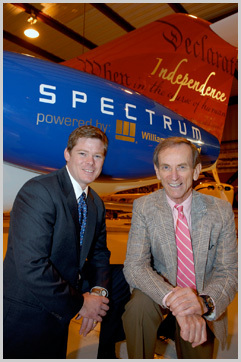 Spectrum’s goal is to drive the high cost out of private jet travel through practical application of better technology. Our focus is working with advanced composites to create unique structures which perform better than anything currently available, or in development. We’ve proven we can do that. We have worked diligently over the last 25 years gaining the expertise required to design and build our unique aircraft. Along the way, we have assembled one of the most creative and dynamic teams in the industry. Together we will deliver more efficient airplanes which are cost effective to operate while producing the lowest emission footprint possible. By incorporating advanced tooling techniques with automated and repeatable manufacturing processes, we are fielding better structures which yield a more integrated, stronger and higher performing aircraft. Our composite technologies are complimented by excellence in design. Our team has focused on delivering next generation aerodynamics combined with reliable, high performance systems. A key part of making Spectrum airplanes better is working with great suppliers like GE Honda Aero Engines, Honeywell, Williams International, and many other industry and technology leaders. Spectrum is focused on technical development, and we have avoided the normal public relations-centric approach to new aircraft development. As such, we have maintained a visible, yet low key presence in the industry and will continue to do so. Our team has been at this a long time and feel like there will be plenty of time to share the results when we start delivery. We’re happy to report that day is within reach. We hope that you will enjoy learning about the Freedom S.40 and Independence S.33. With their superior performance and economics these remarkable airplanes will deliver a new horizon of opportunity for private jet travel. We look forward to sharing the adventure with you.